Nfu-oh 51 is a BEAUTIFUL flakie suspended in purple jelly, with some glass flecks. The multichrome effect reminds me of opal actually. 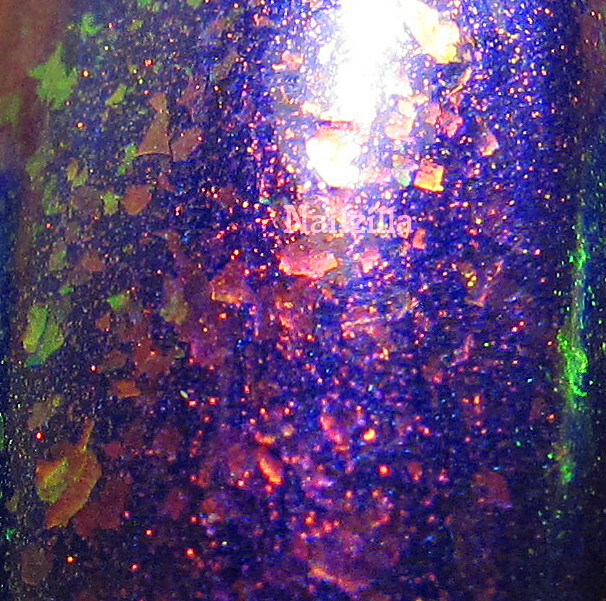 In the bottle, it looks like fire (bottle pic here) and on the nail, it turns a bit more blue/purple. I swatched this over black and the flakies turned red! The formula is smooth, the brush picks up enough flakies to how with one swipe. I did two coats over SH xtreme deep purple (which turned out a little sheer) and the effect is wonderful! This lasted three days on me and didn't chip (with top coat) and then I just got tired of purple. This one is definitely a great polish to layer with, as well as fine on its own. It's like a pre-made jelly sandwich!